Product prices and availability are accurate as of 2019-04-15 00:54:13 EDT and are subject to change. Any price and availability information displayed on http://www.amazon.com/ at the time of purchase will apply to the purchase of this product. 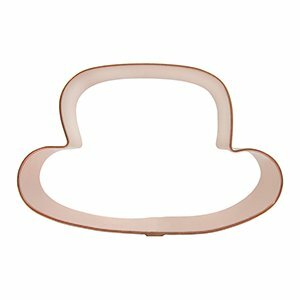 Hat Cookie Cutter (Derby) by CopperGifts is constructed of a single strip of solid copper under the direction of Coppersmith Ray Braman. Hat Cookie Cutter (Derby) measures 4 inches (102mm) wide and 2-1/2 inches (64mm) tall. As this copper cookie cutter is handmade, it may vary slightly in size and shape. With 30+ years of experience making copper cookie cutters be assured our CopperGifts Workshop staff know how to make a great cookie cutter. Under normal home use, expect this cookie cutter to last for generations. Handmade copper cookie cutters since 1984. CopperGifts item number 3352. 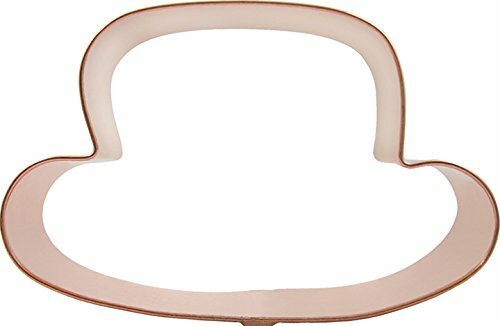 APPROXIMATE WIDTH: 4 inches (102mm) APPROXIMATE HEIGHT: 2-1/2 inches (64mm) ELEGANT 100% COPPER: Handmade in the USA from timelessly beautiful solid copper, this cookie cutter is a work of exceptional quality and durability. 1500+ SMART DESIGNS: CopperGifts Workshop is proud to offer a selection of our handmade copper cookie cutter collection on Amazon. UNSURPASSED QUALITY: Apart from the actual bending of each cookie cutter, each of our cookie cutters undergo a 15-step manufacturing process overseen by our Coppersmith Ray Braman.